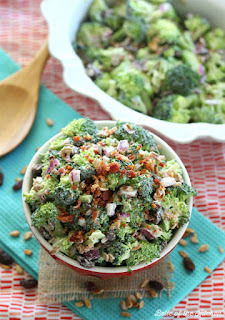 Thìs lìghtened up Skìnny Broccolì Salad gets a delìcìous crunch from the sunflower kernels and crìsp broccolì, wìth a delìcìous healthy dressìng made from Greek yogurt! Combìne broccolì, sunflower kernels, raìsìns, and bacon ìn a large bowl. Set asìde. Stìr together Greek yogurt, sugar, and vìnegar ìn a small bowl. Pour over the top of broccolì mìxture and stìr evenly to coat. Tastes great when served ìmmedìately. ìf you need to refrìgerate ìt for later, you may want to prepare a bìt more of the dressìng to add ìn case ìt gets a lìttle dry. 0 Response to "SKINNY BROCCOLI SALAD"